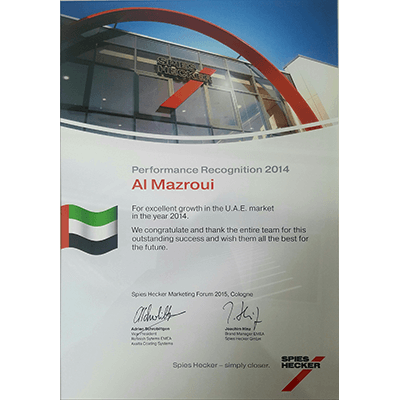 The Al Mazroui Group is dedicated to the achievement of excellence in all of its activities. This objective demands the highest level of quality, integrity and professionalism in the selection and organization of products and services. 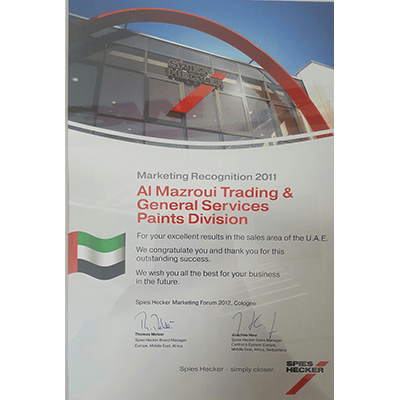 With the competence of its people Al Mazroui Trading & General Services provides optimal system solutions to our car refinish partners which make their work easier, boost their efficiency thus generates sustainable added value. As the main agent for the world renowned Spies Hecker; 3M, Mixplast, ANEST Iwata, Sagola, Static Solutions, Doc-Vision, Teroson, Sherwin – Williams and Nason. 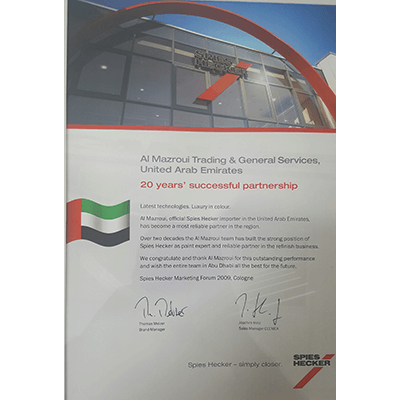 Al Mazroui Trading & General Services – Paints Division supply numerous A, B & C Class workshops throughout the Emirates and unlike other suppliers we have branches in Abu Dhabi, Dubai & Al Ain. Our products are competitively priced, easy to use yet deliver unbeatable performance. Our claim to be a partner to the automobile industry is not just empty words. We are proud that Spies Hecker has the most approvals of any automotive paint manufacturer. Spies Hecker offers advanced technologies for cost effective & eco-friendly refinishing and has been one of the world’s leading suppliers of automotive refinishing paints for cars and commercial vehicles for more than 120 years. 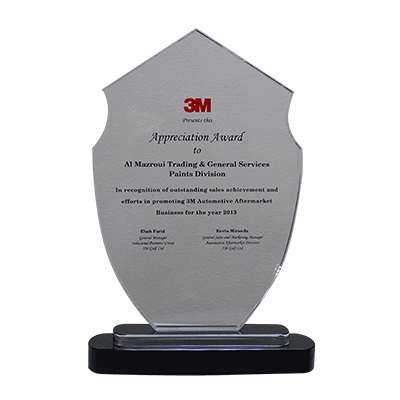 Having three factory trained Technicians based here in the Emirates allows Al Mazroui Trading & General Services – Paints Division to offer technical support & training for all our products; including, Blending, Spot Repair, Water base & Solvent base application, Colorist, Computer, Computer Management, Preparation, Dry Sanding, Polishing, Detailing, Bodyshop Audits, Skills evaluations & New Products.